New research with mice shows that the growth factor neuregulin1 supports nerve repair and the redevelopment of the myelin layer. From their cell bodies to their terminals in muscle or skin, neuronal extensions or axons in the peripheral nervous system are surrounded along their entire length by glial cells. These cells, which are known as Schwann cells, envelop the axons with an insulating sheath called myelin, which enables the rapid transmission of electrical impulses. Following injury to a peripheral nerve, the damaged axons degenerate. After a few weeks, however, they regenerate and are then recovered with myelin by the Schwann cells. For thus far unexplained reasons, however, the Schwann cells do not manage to regenerate the myelin sheaths completely. Thus the function of damaged nerves often remains permanently impaired and certain muscles remain paralyzed in affected patients. In a current research study, the scientists have succeeded in showing that the growth factor neuregulin1 supports nerve repair and the redevelopment of the myelin layer. This protein is usually produced by neurons and is localized on axons where it acts as an important signal for the maturation of Schwann cells and myelin formation. 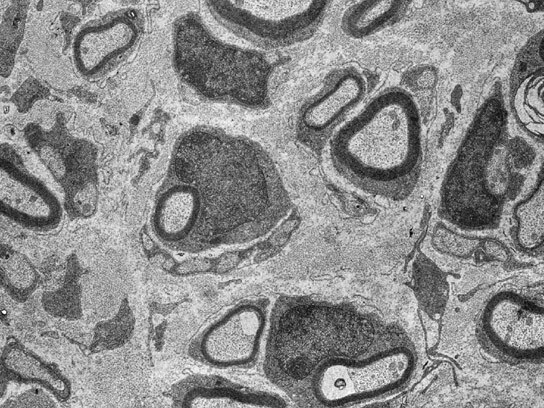 Because the axons rapidly degenerate after injury, the remaining Schwann cells lose their contact with the axons. They thus lack the neuregulin1 signal of the nervous fibers. “In the phase following nerve damage, in which the axons are missing, the Schwann cells must carry out many tasks without the help of axonal signals. If the Schwann cells cannot overcome this first major obstacle in the aftermath of nerve injury, the nerve cannot be adequately repaired,” explains Ruth Stassart, one of the study authors. To prevent this, the Schwann cells themselves take over the production of the actual neuronal signal molecule. After nerve damage, they synthesize the neuregulin1 protein until the axons have grown again. With the help of genetically modified mice, the researchers working on this study were able to show that the neuregulin1 produced in Schwann cells is necessary for the new maturation of the Schwann cells and the regeneration of the myelin sheath after injury. “In mice that lack the neuregulin1 gene in their Schwann cells, the already incomplete nerve regeneration process is extensively impaired,” explains co-author Robert Fledrich. Publication: Ruth M Stassart, Robert Fledrich, Viktorija Velanac, Bastian G Brinkmann, Markus H Schwab, Dies Meijer, Michael W Sereda & Klaus-Armin Nave, “A role for Schwann cell–derived neuregulin-1 in remyelination,” Nature Neuroscience, 2013 Jan; 16(1):48-54. doi: 10.1038/nn.3281. 1 Comment on "Glial Cells Produce Neuregulin1 Promoting the Regeneration of Nerve Tissue"